Three different types of papers were used in this collage: painted magazine papers, Citra Solv papers, and a piece of baked parchment from underneath a loaf of home baked bread. When it comes to making art, nothing gets thrown out until I decide whether or not it’s usable. As time goes on, I’m enjoying more and more the challenge of making something from materials of humble beginnings, rather than manufactured art supplies. Part of it is the creative challenge, and the other part of it is my deep concern for the environment. Don’t we have enough “stuff” already? I was so inspired by the very talented artist Cat Storey’s blog post about a completed project in which she created art every day for a month and posted it to her blog. At the end of her project and in this post, she shows a mosaic of the resulting work. After seeing hers, I wanted to create one of my own. 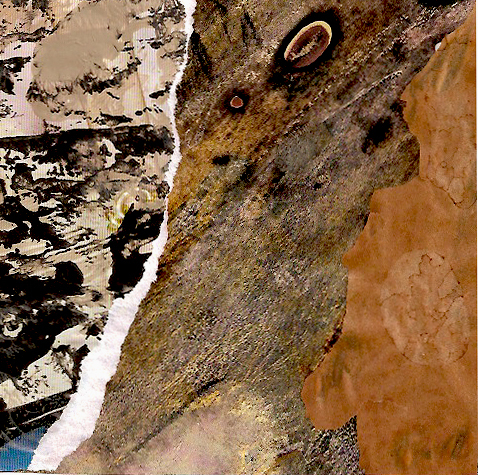 This is just a screen shot of my collage set on flickr. Kind of fun to see a whole array of different images together. Still, I think I like Cat’s better! Have a great weekend. I hope it includes some time outdoors and some time for art! You’re so sweet, but I like yours better–it really looks great! Someone called mine a “quilt,” though, and I liked that–don’t you? Very cool, Martha! I love the idea of using used parchment paper in a collage. The collage set is awesome – I would love to try some mixed media pieces like this, but my artistic abilities don’t appear to extend to creating “something out of little bits of unrelated nothings”, as it were. Sonya, glad you like the thumbnail mosaic. I think you might enjoy just playing around with some collage. It took me a very long time to decide how to approach it. The best way for my purposes is just not to let myself “think” too much. It’s very much a right brain activity for me. A wonderful and playful mosaic of collages – looks great together, but I’m sure each piece shines on its own! everyday day out of whatever I find on the street each day. I will end up with 31 cards but they will be small enough to carry along with a glue stick & gel. I wish I knew how to start a Blog! I’ll find a way to let you know how it’s going. Thank you and all your contributers for inspiration. Janice, that sounds so exciting! You can do a blog — it’s very easy. I’d suggest Blogger. I think it’s the most user friendly. Feel free to email me if you decide to try it and hit a snag. Best to you in your travel and collage adventure! I am a full time studio artist. This blog is a collection of my influences, experiments, and other eclectic pursuits.